These tweets chimed into my recent thoughts, that we desperately need fairer streaming and funding models both for artists and labels. Whilst on the face of it the Swedish platform Spotify, founded in 2006 and led by CEO Daniel Ek, has filled a profit’s gap for the industry generally and is a good application for listeners, ten pounds for all the music your heart desires or for free via the ad-supported tier is a bargain, it has led to some worrying consequences for music. A devaluation in music? If you can hear everything where is the incentive to prize music, to value it? I don’t want to sound like an old Luddite here as I do stream but I also still buy music, for me. Nothing beats the anticipation and joy of record shopping and there’s no doubt the artwork and sound are superior, but despite a vinyl revival, clearly digital is the future. We’ve seen a decline in physical sales of records in the UK and US. When it comes to music consumption it seems convenience and cost have trumped all. Record label trade body BPI confirmed demand in 2018 was driven by 91 billion audio streams served through Spotify, Apple Music, Deezer, and other audio streaming services. This represents a 33.5 per cent rise in 2017 and a 2,350 per cent increase since 2012. Audio streaming now accounts for nearly two thirds (63.6%) of all UK domestic music consumption. Albums saw a rise of 5.7% – that’s the year-on-year growth in ‘album equivalent sales’ (AES) – a metric under which 10 single-track sales is a ‘track equivalent album’, and 1,000 audio streams a ‘streaming equivalent album’. The AES total for 2017 was 135.1m, and for 2018 it was 142.9m. This increase was chiefly thanks to the premium streaming services like Spotify and Apple Music. The subscription side of streaming was up 34.9% in 2018, with said subscriptions now 54% of UK recorded music income, which comes in at £467.6 million. However, physical sales declined by 16.6% to £383.2m, while music-downloads sales fell by 25.7% to £122.6m. But in some good news, the vinyl revival continues but has started to slow, with 4.2 million records sold, a rise of just 1.6%, said the BPI. Whilst on the face of it these profits are good news for the record industry generally and the major labels in particular, when at the turn of the decade they had seen the decline of the mp3 and in revenues. But physical now only accounts for 28% of today revenues. Sales of CDs plummeted by 23% last year, as consumers increasingly moved to streaming services for their music. Just 32 million CDs were sold in 2018 – almost 100 million fewer than in 2008; and a drop of 9.6 million year-on-year. It remains the case that these profits aren’t being shared by its songwriters and creators, Currently, Spotify pays just somewhere between £0.0046 and 0.0064 per stream to the holder of music rights. And the “holder” can be split among the record label, producers, artists, and songwriters. 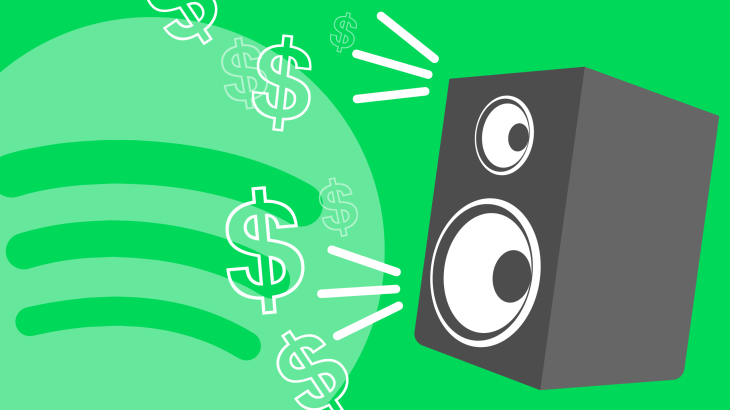 By doing deals with Spotify and under writing the platform in its early years the major labels have received an oversized return on their investment, an influence on the visibility of its artists on the platform and in the process skewed the royalty rates for the majority of artists, ultimately eating into Spotify’s profits. In recent years Taylor Swift removed her music in protest at these rates as did Radiohead, both later coming to arrangements with Spotify, but other acts aren’t so lucky to have such name recognition, label backing and leverage with the company. Spotify has faced numerous legal challenges to its mechanical, and copyrights payouts, losing a case led by David Lowery reaching a settlement worth more than $112.55 million, including an immediate cash payment of $43.55 million to class members and a commitment to pay ongoing royalties. In 2015 Geoff Barrow (Beak>, Portishead) tweeted claiming that despite his music being streamed approximately 34,000,000 times, he’s only made £1,700 after tax. Barrow wrote: “34,000,000 streams Income After tax = £1700 Thank U @apple @YouTube @Spotify especially @UMG_News for selling our music so cheaply.” Barrow’s claim would mean that he and his band receive approximately 0.000005 pence per stream. Later he tweeted “I’ve got nothing against streaming a record. But I’ve got a lot against people giving my work away for free” commenting that it won’t be bands such as Portishead that will suffer the most, but the “young bands like the ones in [Barrow’s own] label Invada”. Whilst it has provided some extra income for the industry as a whole, generally, streaming has also helped change the culture of music consumption, which means that is part of the accelerated shift from physical to digital. Whilst of course technology constantly evolves as do modes of delivery, there is in my view a correlation between the sharp spike in streaming and the decline in record sales, which is particularly steep since 2016. Spotify is such a useable application that it has created the illusion of ownership where there is none. It may appear that all of the music is downloaded to your device, but in reality, you are only accessing their system: if you can’t get on the internet one day, you cannot listen to all of rhe music on Spotify in the same way you can on iTunes. In film and television, the transition to digital and streaming was handled in a much better way, in stages, and arguably a service like Netflix investing in its creators has been more beneficial for both art forms. Maybe the industry brought it upon themselves – years of overcharging for CDs and fighting downloading in the Napster years led to an increase in illegal downloading, stream ripping and torrents. Spotify and other streaming services were the response. In Spotify’s case, there are questions about whether they care about music at all, or whether it’s merely a way of drawing people into their payment model and selling hardware in the case of Apple. The recent deletion of Myspace’s mp3 catalogue recently proves that Tech giants care about their bottom line and that isn’t a surprise. Most importantly for artists, Spotify doesn’t pay very well, if anything their royalty rate doesn’t compare well with Apple. So whilst for some big artists and labels streaming has given them access to new revenue streams and ways to promote themselves on playlists, for smaller and middle tier artists faced with a collapse in the value of their recorded output and a struggle to make money from touring, the picture is more difficult. BuzzAngle Music says more than 99 per cent of audio streaming is of the top 10 per cent most-streamed tracks. Which means less than 1 per cent of streams accounts for all other music. So how do you survive and grow your audience in an environment where the wealth and interest are increasingly concentrated at the top? At the end of last year, Spotify launched a clever graphic to display and promote the number of streams its artists had gained. Some saw this as a way of humourously pointing out the disparity in Spotify royalty rates. Streaming is here to stay but given this environment, we need new ways to directly support the artist, songwriters, and labels who put so much hard work and funds into writing and recording the music we enjoy. Buying music directly from the artist via Bandcamp or their website or going to a gig is always the best way to support artists, but the reality is streaming is becoming dominant so we need to think about better models. There are also direct to fan platforms that create a dialogue and funding relationship between fans and artists. We will look at these in more detail in my next article. When you pay your ten pound Spotify subscription, that money is meant to be split between the artists you listen to, but it isn’t even fairly split between the creators, it goes into a central Spotify pot then is divided down and distributed at Spotify’s discretion and given their deals with major labels we can only assume there is an imbalance. Some have even called for a payment button on artists Spotify profiles as a way of promoting subscribers to further support their favourite artists. Worse still Spotify Amazon, Google and Pandora – recently lodged legal appeals against the US Copyright Royalty Board’s recent decision to raise streaming royalties for songwriters (and music publishers) by 44%.rates that Billboard&nbsp; says have reduced from 15 hundredths of a cent per stream in 2014 to 11 hundredths of a cent per stream in 2018. Apple Music, in contrast, has accepted the new rates and declined to challenge what’s viewed as an important pay hike for songwriters. He condemns the fact that artists are paid “a terribly low rate” from Spotify’s free tier while calling on the company to drop its legal appeal entirely. There are of course positives to Spotify and the internet: as a listener the choice is dizzying and scope of music’s history is all available to you at the click of a button, back in the day even during my teens in the 1990s when music was only available in record shops you were limited by what you could afford, but now music is freely available online. Although sometimes we are overwhelmed with choice and it’s harder for releases to stand out. It’s also another form of promotion open to emerging artists. Adwaith, for instance, had their song ‘Fel I Fod’ gain over 600,000 streams this year, yet the return is minuscule. There is a good element of try before you buy with streaming platforms allowing you to listen before you invest, however, the effects of any Shopify model are more than outweighed by the fact that the habit of music ownership is dying with younger people, who mostly are out of the habit of buying records or even downloads. A recent report stated that many young people now mostly experience music through tinny laptop speakers or phones through Youtube(which pays even more badly than any streaming platform), so whilst it has encouraged some to buy more it has created a streaming culture where music is taken for granted and the sound and experience has often become devalued too. Playlists are one of the positive discovery aspects of Spotify indeed curated playlists can be brilliant, we run a few ourselves. They can work for getting the attention of a bigger audience for emerging acts and indie label bands. The North Wales based label Popty Ping tweeted about a positive “The lovely @GreenManFest booked @Gintismusic who hadn’t even released a record for 7 or so years. They took a risk on the fact the band had been recording with Bill. Anyhow, playing the rising stage we had no idea if anyone would watch. However, to make it onto a bigger playlist is very hard. Informed by algorithms and Spotify’s shadowy brands and curators, there’s a mystery to how playlists are put together. Many argue Spotify is a gamed system, where already known or major label artists are automatically included in such playlists and encouraged to create their own, popular songs are perpetuated by algorithms, placements and most listened to charts, thereby reinforcing their place. This dominance of streaming is reflected by the charts too. In the past when records could gatecrash the mainstream through a groundswell of sales and an audience informed by Top of the Pops or radio, now that door is usually shut. With tracks increasingly changed for the platform, intros cut and a new Spotify sound emerging, perhaps summed up best by the plethora of bland singer-songwriters who create background music that suits the platforms diminishing levels of listener engagement, that have followed in Ed Sheeran’s wake. Even credible pop artists like Janelle Monae and St Vincent fail to break through into the singles in this new world despite huge critical success and radio play. Billie Eilish‘s chart success this week does counter this idea though, her subtle pop sound retooled to be streaming friendly and it’s quite nice to see such an odd daring pop record doing so well in both the singles and album charts, in this risk-averse time. There are also some other more sinister effects to playlists, the erosion of the importance of the artists, the increase of background listening and a subtle kind of mind control that uses music to hook you onto its subscription service and as a consumer tester that sells your products. The music and artist are less important to Spotify than the mood it creates. In a new book entitled Spotify Teardown detailed by Angus Batey the Quietus last week “The authors point out how Spotify’s playlists (some human-curated, some automatically generated in response to user input) operate as (unintended?) mind-control experiments the way Spotify playlists are eroding the notion of music as art with intrinsic value – not just commercial or monetary value, but creative and cultural value. But how does their model differ from Spotify? “Spotify states that their highest potential per-stream rate is $.0084. If we divide the cost of an iTunes download (after Apple takes their cut) by that stream rate, we get 107. That’s how many times you’d have to listen to the the same song on Spotify for the artist to get paid the same amount as a download. With us, it’s just nine plays. The challenges and changes that streaming brings are just one of the issues facing grassroots music right now, including a threat to smaller venues, cuts to music funding, Brexit and austerity. This isn’t a plea for the dismantling of Spotify as such, there are good things about its service, it is an excellently handy app for listeners, it has provided another stream of income for the industry generally. However, its a plea for fairer royalty shares, greater plurality and democracy, tech giants like Spotify, Google, Facebook and Apple are too powerful. They are entrenching inequality and seek profit over art. We need greater choice. As we have seen in the election of Trump and Brexit its algorithms can be manipulated by shadowy actors. Spotify is using music as a means to gain a foothold in the market yet they don’t want share the profits, it’s lost money for years until just this year and that’s despite stock floatation and the backing of the industry. Is it even a sustainable model in its current form? As has been shown by many cases they don’t care about the well being or remuneration of most of its partners the creators, artists, and labels. The wiping of Myspace is a warning that we can’t entrust corporations to be musical archivists. We are hoping that Spotify won’t just dispense with the music that isn’t popular at some point, in some cases, they are already creating fake artists to populate its increasingly faceless mood playlists, because it’s cheaper. As a platform, it largely reinforces what is already popular and in some ways shrinks discovery. We need better ways of supporting the artists we like directly, of course, the best way is to buy a record, some merch or a ticket to see the artists you like but that doesn’t change the fact that streaming is here and the increasingly easy and popular way to enjoy music. Pitchfork published a piece on how to be a responsible music fan in the age of the streaming world, last year. You might think art isn’t commerce and being a musician shouldn’t necessarily be a ‘career’; it’s about the ‘art’ and music is only worth what someone wants to pay for it, which is a view, but when the cost of even making, performing and promoting music vastly outstrips what you receive for it at the end, it becomes a very expensive vocation between paid jobs for emerging and middle tier acts, that only certain people can afford to pursue. Which is part of the devaluation of music and prohibits certain groups from participating in it, which is a real shame. There is still great music out there but the mainstream is often a bad representation of it. The truth is many of our favourite acts took years of playing, writing and recording and investment to finally develop their art. So we need a 360-degree approach to funding artists, better platforms, sync deals. As fans, we need to think about how we spend our money on music and whether it goes directly to the artist. We also need to demand fairer royalty rates from existing streaming platforms and support more of a mix of direct to artist funding models (Patreon, Kickstarter, Pledge), artists and labels need to consider which services benefit them, maybe only if bigger artists start to move away from Spotify will things begin to change, because if they don’t, the artists we love may not be able to continue to produce music anymore. They may never get to the stage where they can sustain and develop their art or tour, they may not get heard. Let’s face it our lives would be all the poorer for that. Great insight into a rotten industry. The answer is alternative music streaming services with better payouts. It’s a pretty clever and convenient service. It doen’t have monthly fee, you only pay for what you actually stream, you can also own and download the music you stream, you can even co-own the platform itself for just a few bucks, and then share in decisions and in profits. Resonate is indeed an ethical solution to the problem of the unfairly distributed ‘big pool’ of subscription streaming revenue.